The attached and translated article “Mobiilisovellus pikkupotilaan tukena” has been originally published on Pohjanpiiri magazine in February, 2017 (Issue 1/2017). Pohjanpiiri is the employee magazine of Northern Ostrobothnia Hospital District that owns and operates Oulu University Hospital in Finland. You can read it in Finnish by downloading PDF copy here. 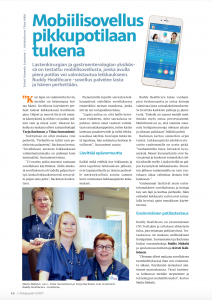 Nurses of Oulu University Hospital tells their experiences about BuddyCare. A mobile app that helps little patients prepare for pediatric surgery has been tested in the department of pediatric surgery and gastroenterology at Oulu University Hospital (OYS) in Finland. The Buddy Healthcare app serves the child and their family. “When the child has been prepared well, it is easier for us to take care of them. Families who have used the app come to the surgery feeling calmer. You find the rules and advices from your own phone and you can return to them anywhere and everywhere”, say Tarja Backman and Tiina Suoraniemi, nurses who participated in the trial. Several families have participated in testing. “There has only been positive feedback from the families”, Backman says. “Thanks to the app, you have more time to prepare for the surgery than usually”, Suoraniemi states. “A 13-year-old boy was excited when he got the app to his phone. His mother thought that the app was very useful, because it made the surgery the boy’s own thing”, Backman concretizes. To smaller children, the app shows the surgery day as a story that mom or dad can read to the child. “It helps children that they are told beforehand what happens in the hospital: how their own clothes are switched to hospital clothes, how anesthetic cream is put to their hands, and what the operating room looks like. When the child knows what is happening, they have a calm attitude towards the procedure”, Suoraniemi says. Everything that happens before the surgery itself and afterwards is significant to the child patient and their family, just like the experiences of the surgery day. Buddy Healthcare helps parents get information and gives advice how to prepare the child for the hospital experience. That lessens everyone’s fears and nervousness. “The trial has made us think of our own process as well. It is significant that we can direct caretaker resources at the right time and to the right place”, Mäkelä ponders. Parents also fill a pre-questionnaire in the app and the nurse looks through it and confirms it for the family. So the pre-information about the surgery arrives to the hospital in time to be used beforehand. Buddy Healthcare is the first result of collaboration between OYS TestLab and the company that is tested in patient work. A team of four nurses participates in testing: besides Suoraniemi and Backman, the team includes unit nurse Mailis Mäkelä and unit nurse assistant Kirsti Kähkönen. “We have participated in the app’s product development ever since its visioning. We started testing it in practise in November. In this product, our needs meet the possibilities of technology”, says Mailis Mäkelä. The app supports a national protocol about emotional support of small children in daily surgical care work. The protocol was created in OYS. “The protocol demands us to develop patient direction and advice related to fast-paced daily surgery”, Mäkelä says. Pediatric surgery patients and their parents are usually technologically enlightened and capable. “During the testing, we have been able to conclude that technology serves young patients and won’t overcome humans”, Mailis Mäkelä concludes. Määttä states that the app makes sure that the care process is successful and prevents cancellations of surgery time, as the information travels in real time between the hospital and the patient.